Andean flamingo mating dance, is the unintentionally hilarious mating dance of the Phoenicopterus andinus, the Andean flamingos. These beautiful flamingos are puttering around an extremely caustic salt lake in Chile, high on the Altiplano in the Andes mountains in South America. In this video you can hear sound of Andean flamingos gabbling. This Andean flamingo mating dance is how they choose their mates. They are walking – dancing up side down the lake, switching their necks from right to left and backwards, upside down, always all together, they are amazing. 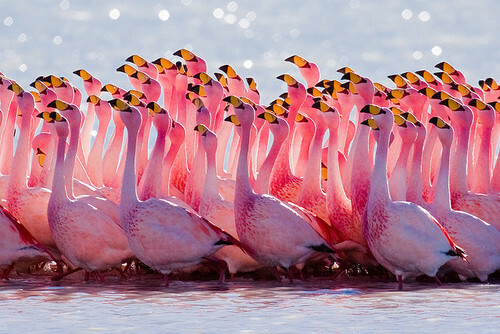 These are Chilean flamingos, but wherever there are flamingos in the world, they do the same dance. Enjoy the amazing Andean flamingo mating dance.